On the heels of her first appearance at The Tonys since 1970, Columbia Records has announced Barbra Streisand's "ENCORE: Movie Partners Sing Broadway" album will debut on August 26th, 2016, featuring 10 new Streisand duets of Broadway classics with some of the biggest stars in Hollywood. The inspired new musical pairings on "ENCORE: Movie Partners Sing Broadway" include Alec Baldwin, Antonio Banderas, Jamie Foxx, Anne Hathaway, Hugh Jackman, Seth MacFarlane, Melissa McCarthy, Chris Pine, Daisy Ridley, Patrick Wilson, and a spectacular virtual duet with Anthony Newley. The release of "ENCORE: Movie Partners Sing Broadway" follows the recording artist's nine-city August North American concert tour: THE MUSIC…THE MEM'RIES…THE MAGIC! during which she will perform hits from her ground-breaking career. 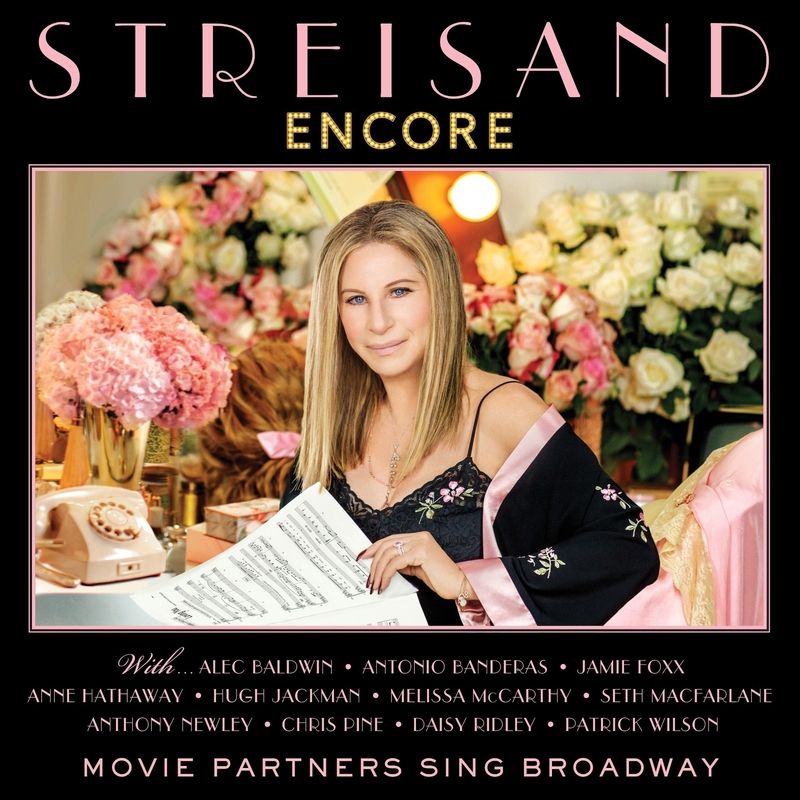 The greatest star to ever come out of Broadway, Streisand returns to her roots with "ENCORE: Movie Partners Sing Broadway." The legendary performer rose to unprecedented fame while starring on Broadway beginning with her stage debut in "I Can Get It For You Wholesale" in 1962 and then as comedienne Fanny Brice in the Broadway production of "Funny Girl" in 1964, earning Tony nominations for both turns. Streisand's very first record album, 1963's "The Barbra Streisand album," which earned Grammys for Album of the Year and Best Female Vocal Performances, featured several Broadway standards. In 1985 Streisand released "The Broadway Album" and in 1993 "Back to Broadway;" both albums went multi-platinum. With the longest span of number one albums in history - six decades - Streisand has recorded 52 gold, 31 platinum and 13 multi-platinum albums in her career. She is the only woman to make the All-Time Top 10 Best Selling Artists list. With the release of her last album, "Partners," Streisand has had 33 albums make the Top 10 on the US charts. She is the only female artist to have achieved this milestone, tying her with Frank Sinatra. With ten, Streisand is the female artist with the most number one albums in Billboard's history. Widely recognized as an icon in multiple entertainment fields, Streisand has attained unprecedented achievements as a recording artist, actor, concert performer, producer, director, author and songwriter. Streisand has been awarded two Oscars, five Emmys, ten Golden Globes, eight Grammys plus two special Grammys, a special Tony award in 1970, and two CableACE Awards – the only artist to receive honors in all of those fields of endeavor. Streisand received the Presidential Medal of Freedom from President Barack Obama this past November. Her many other honors include the American Film Institute's Lifetime Achievement Award, the National Endowment for the Arts Medal, three Peabody Awards and the French Légion d'Honneur. She is also the first female film director to receive the Kennedy Center Honors. Streisand is a devoted philanthropist who works tirelessly to fight for what she believes in. A woman of action, Streisand founded The Barbra Streisand Women's Heart Center at Cedars-Sinai and co-founded the Women's Heart Alliance, helping to raise awareness and push for more research into women's heart disease, the leading cause of death among women. "At The Ballet." With Anne Hathaway and Daisy Ridley. From "A Chorus Line," Winner of the Tony Award for Best Musical and Pulitzer Prize. In referring to "At The Ballet," composer Marvin Hamlisch said that "the song set the tone for all the music in the show; once the song was written, the creators understood the shape and color of the piece as a whole." Anne Hathaway: Actress, singer, Academy Award winner for her role in Les Misérables, winner of Golden Globe Award, Emmy Award, Screen Actors Guild Award, BAFTA Award. Daisy Ridley: Starred as Rey in STAR WARS: THE FORCE AWAKENS - the highest-grossing film of 2015. She will continue her role as Rey in STAR WAS: EPISODE VIII, scheduled for release in December 2017. "Loving You." With Patrick Wilson. From Stephen Sondheim's "Passion." "Passion" opened on Broadway in 1994 and was the winner of the Tony Award for Best Musical. Patrick Wilson: Actor and singer who began his career starring in Broadway musicals. Two-time Tony Award nominee, Golden Globe Award nominee and Emmy Award nominee. Starred in the major motion picture adaption of Broadway's The Phantom of the Opera and the television series "Fargo." "Who Can I Turn To (When Nobody Needs Me)?" With Anthony Newley. From "The Roar of the Greasepaint - The Smell of the Crowd" - a musical with book, music, and lyrics by Leslie Bricusse and Anthony Newley. Anthony Newley: Legendary actor, singer, and songwriter. As a recording artist he enjoyed a dozen Top 40 songs on the UK Singles Chart between 1959 and 1962, starred on Broadway in "Stop The World – I Want To Get Off" and "The Roar Of The Greasepaint – The Smell Of The Crowd." Best Film Score Academy Award nominee for film score for WILLY WONKA & THE CHOCOLATE FACTORY. Inducted into the Songwriters Hall of Fame in 1989. Grammy Award winner for Song of the Year for "What Kind Of Fool Am I." "The Best Thing That Ever Has Happened." With Alec Baldwin. From "Road Show." "Road Show is a musical with music and lyrics by Stephen Sondheim and book by John Weidman. Alec Baldwin: Actor, producer, comedian, Broadway star, winner of two Emmy Awards, three Golden Globe Awards and seven Screen Actors Guild Awards. Columnist for Huffington Post, podcast host. "Any Moment Now." With Hugh Jackman. From an unproduced version of "Smile." Music by Marvin Hamlisch; book and lyrics by Dorothy Fields. Hugh Jackman: Stage and screen star, known for roles ranging from WOLVERINE, Jean Valjean in LES MISERABLES , Tony Award winning portrayal of Peter Allen in "The Boy From Oz," and host of the Tony Awards and Academy Awards. "Anything You Can Do." With Melissa McCarthy. From "Annie Get Your Gun." Music and lyrics by Irving Berlin and a book by Dorothy Fields and her brother Herbert Fields. The story is a fictionalized version of the life of Annie Oakley, a sharpshooter who starred in Buffalo Bill's Wild West. The 1946 Broadway production was a hit and the musical had long runs in both New York and London and spawned revivals, a 1950 film version and television versions. Actress, comedian, writer, fashion designer and producer. Known for roles on television shows "Gilmore Girls" and "Mike & Molly," host on "Saturday Night Live," and films BRIDESMAIDS – which garnered her an Academy Award nomination for Best Supporting Actress, IDENTITY THIEF, THE HEAT, TAMMY, ST. VINCENT, and the action comedy SPY - for which she received the Golden Globe Award for Best Actress – Motion Picture Comedy or Musical. She is set to star in the 2016 re-boot of GHOSTBUSTERS. "Pure Imagination." With Seth MacFarlane. Written for the motion picture WILLY WONKA AND THE CHOCOLATE FACTORY - a musical version of the beloved Roald Dahl book. Written by Leslie Bricusse and Anthony Newley. Featured in hit West End Stage Musical "Charlie and the Chocolate Factory" set to open on Broadway in 2017. Seth MacFarlane: Actor, filmmaker, singer, and creator of "Family Guy," co-creator of "American Dad!" and "The Cleveland Show," writer-director of TED and TED 2. Emmy Award winner, Webby Award Winner for Film & Video Person of the Year. As a singer he has performed at Carnegie Hall and the Royal Albert Hall. Host of Academy Awards and executive producer of "Cosmos: A Spacetime Odyssey." "Take Me To The World." With Antonio Banderas. From "Evening Primrose." "Evening Primrose" is a musical with book by James Goldman and lyrics and music by Stephen Sondheim. It was originally written for television and is based on a John Collier short story published in 1951. Antonio Banderas: Actor, director, producer. He began his acting career in a series of films by director Pedro Almodóvar and starred in films as diverse as PHILADELPHIA, EVITA, THE MASK OF ZORRO, SPY KIDS and SHREK. Banderas appeared on Broadway to great acclaim in "Nine" – winning the Outer Critics Circle and Drama Desk Awards and nominated for a Tony Award. "I'll Be Seeing You"/ "I've Grown Accustomed To Your Face." With Chris Pine. From "Right This Way"/ "My Fair Lady." "Right This Way" opened in 1938. "I'll Be Seeing You" became the unofficial anthem of WWII, later recorded by Frank Sinatra, Tony Bennett, Peggy Lee and dozens more. "My Fair Lady" is a musical based on George Bernard Shaw's "Pygmalion," with book and lyrics by Alan Jay Lerner and music by Frederick Loewe. The musical's 1956 Broadway production was a momentous hit, setting a record for the longest run of any major musical theater production in history. Chris Pine: Known for his role as Captain James T. Kirk in the most recent STAR TREK reboot series. Starred in THE PRINCESS DIARIES 2, UNSTOPPABLE, HORRIBLE BOSSES 2 and he played Cinderella's Prince in the film adaptation of Stephen Sondheim's musical INTO THE WOODS. "Climb Ev'ry Mountain." With Jamie Foxx. From "The Sound of Music." "The Sound of Music" is a musical with music by Richard Rodgers, lyrics by Oscar Hammerstein II and book by Howard Lindsay and Russel Crouse. The original Broadway production, starring Mary Martin and Theodore Bikel, opened in 1957 and won five Tony Awards, including Best Musical. It was adapted as a 1965 film musical starring Julie Andrews and Christopher Plummer, which won five Academy Awards, including Best Picture and Best Director. Jamie Foxx: Actor, singer, comedian, Academy Award winner as Best Actor for his role in RAY. Also winner of BAFTA Award and Golden Globe. Foxx is also a Grammy winner. He and Kanye West scored a #1 song on the Billboard Hot 100 with "Gold Digger." "I Didn't Know What Time It Was." From "Too Many Girls" which opened on Broadway in 1939 starring Desi Arnaz. The film version starred Lucille Ball and Desi Arnaz and they credited the production for bringing them together as a couple. "Fifty Percent." From "Ballroom." "Ballroom" is a Tony nominated musical with book by Jerome Kass and music by Billy Goldenberg and lyrics by Alan and Marilyn Bergman. Based on the 1975 Emmy Award-winning television drama "Queen of the Stardust Ballroom." "Losing My Mind." From "Follies." "Follies" is a musical with music and lyrics by Stephen Sondheim and a book by James Goldman. The Broadway production opened on April 4, 1971, directed by Harold Prince and Michael Bennett, and with choreography by Bennett. The musical was nominated for eleven Tony Awards and won seven.